If you have had years of dental problems or are embarrassed by missing teeth, our friendly team at Koch Park Dental in Florissant can help. You could be a candidate for dental implants, or implant supported dentures. A removable replacement for missing teeth, dentures can be made in advance and positioned as soon as the natural teeth are removed. Our Koch Park Dental lab creates dentures that look just like natural teeth: attractive, healthy teeth. If you still have some healthy, natural teeth, you can benefit from dentures without having your healthy teeth extracted. Partial dentures fill in the gaps, replacing missing teeth to complete a smile. Partial dentures can prevent natural teeth from moving. Many Florissant dental practices can complete these procedures in one day. Many dental insurance providers cover most or all of the cost of dentures. Call us at Koch Park Dental – Martin L. Buchheit, DDS and we can help you find out if your Missouri dental insurance covers dentures. Another alternative for Florissant people with missing teeth is to receive dental implants. A dental implant is a permanent tooth restoration that is anchored into the jawbone, actually replacing both the root and crown of the tooth. Dental implants have many advantages, such as preventing jaw bone recession which can occur when natural teeth are removed. However, not all Florissant dentistry patients are good candidates for implants. Dental implants can also be used to anchor a removable denture. The denture is ‘snapped on’ or attached to the implants for no-slip confidence. 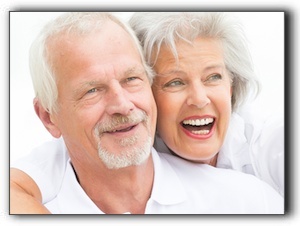 The combination denture/implant smile restoration solution is being used successfully by many Florissant dentists. It is usually more affordable than dental implant replacements for several natural teeth. Replacing missing teeth will benefit your appearance and your health, improving your ability to eat and speak. If you are embarrassed to smile or laugh, it’s time to bring back your beautiful smile! In addition to dental implants, Koch Park Dental in Florissant provides general dentistry. Schedule your next appointment today.